AS a Barangay Ginebra fan, 'Bato' is as solid as a rock. Philippine National Police (PNP) Chief Ronald 'Bato' Dela Rosa bared he has been a diehard Ginebra fan from the time the PBA’s most popular ballclub was beginning to establish the foundation of its never-say-die spirit. The 54-year-old general said he was already following the team back in the time when the great Robert Jaworski Sr. was still the face of the franchise as its playing coach, credited for molding the Kings to the famed squad it is known today. “Ginebra noon pa, panahon pa ni Jaworski,” the police official disclosed to SPIN.ph on Friday night as he watched Game One of the Governors Cup finals between Ginebra and Meralco before a jampacked crowd at the Smart Araneta Coliseum. One by one, he quickly mentioned some of the predecessors of these modern-day Kings who are eyeing their first ever league title over the last eight years. 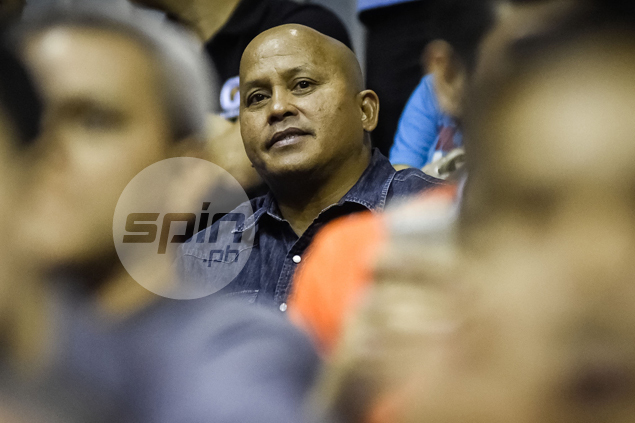 “Distrito, Gonzalgo, Dondon Ampalayo, Loyzaga,” said Dela Rosa, showing how a rock-solid Ginebra fan he is. It was the first time he watched the game live since he assumed the top PNP position, according to him. His answer didn’t come as a surprise when asked who among the Ginebra players is his favorite. “Yung kababayan ko, si Scottie Thompson,” stressed Bato, while adding the veteran duo of Mark Caguioa and JayJay Helterbrand are also on his fave list. Dela Rosa though, admitted he doesn’t know the Ginebra rookie personally. “Alam ko lang kababayan ko siya,” he said of the former NCAA MVP out of Perpetual Help, who is from Padada, Davao del Sur. He got a bit surprised when mentioned that Meralco rookie Baser Amer is also from Davao. Of course, the PNP chief sees Ginebra finally ending its long title drought, saying the best-of-seven series could be over in six games. And as long as his busy schedule would permit it, Dela Rosa vowed to be in the games again.